My Christmas present to myself this year was a trip to the Ultimate Dressage Experience. This equestrian pursuit is the brainchild of dressage rider Sandra Blake Farrell and is based at Dollanstown in Kilcock Co. Kildare. The Ultimate Dressage Experience invites riders to have a lesson on a school master dressage horse and enjoy the feel of more advanced dressage movements. I booked the experience with my friend Dani and was delighted to learn that I would be riding St. Emilion II, Sandra’s grand prix Hanoverian gelding while Dani would be on board Polish warmblood Biala Perla. Having seen St. Emilion II in action in competition with Sandra I was a little worried that I may not be able to ride him effectively. I was also worried that my petite little legs might not be long enough for the dressage saddle! On the day we were sheltered from the wind and rain in the venue’s 60 by 20 metre indoor arena. Dani went first and I was able to watch and listen as Sandra instructed her on board Biala Perla. I have to say I would recommend for anyone to attend the experience with a friend as I learned a huge amount from watching on the ground. 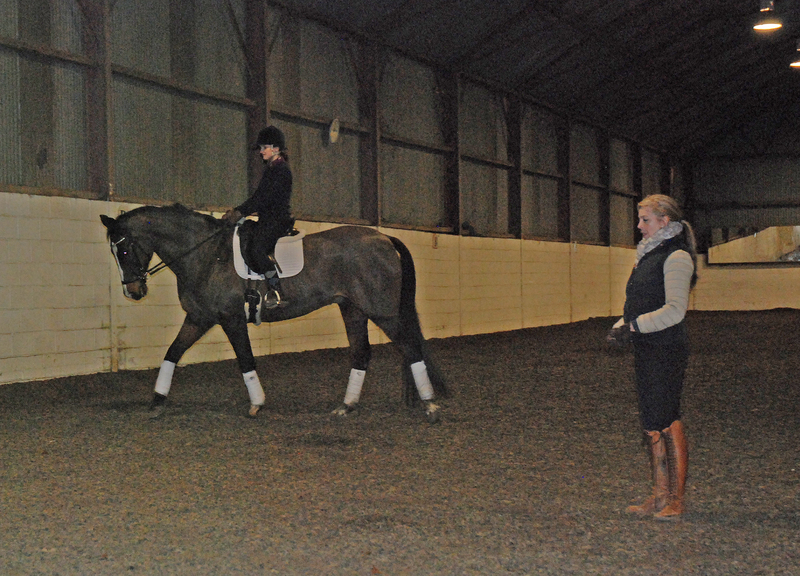 As Dani was guided through exercises such as transitions, travers and walk pirouette, I was able to observe the riders aids, the horses movement and the defining aspects of the movement. Having not fully understood travers before I gained an insight into what the movement hopes to achieve and the reason for the positioning of the horse. And so, it was my turn. Sitting up on a Grand Prix dressage horse for the first time is, I imagine, like sitting in the cockpit of a plane for the first time – so many buttons, so many options but an air of uncertainty of what to press and when. 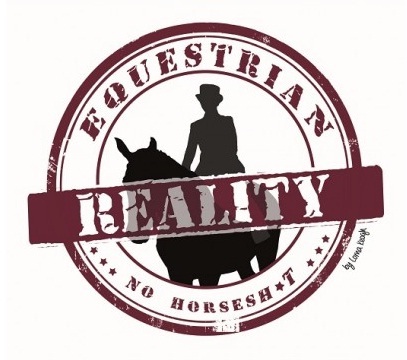 I love dressage and flat work but as I am only currently working towards elementary level on a horse that has never done it before I have no experience of the more complex and lateral movements involved in my goal and beyond. It was my hope that learning more of these on board an experienced animal would allow me to remove part of my frequent ‘Am I asking the horse correctly?’ dilemma when learning new exercises. Plus to be honest I really wanted to see what it is like to ride some of the showier movements without having to practice for years. Grand Prix dressage horse St. Emilion in action. We started off riding shoulder in in walk. Every aid, every rebalance, every movement I made had an impact on the horse. I have never ridden a horse so alert to the riders seat and leg before. Sandra encouraged me to think about what I wanted to ask the horse to do and then to try and translate that into aids. This worked and was a huge confidence boost in my riding. 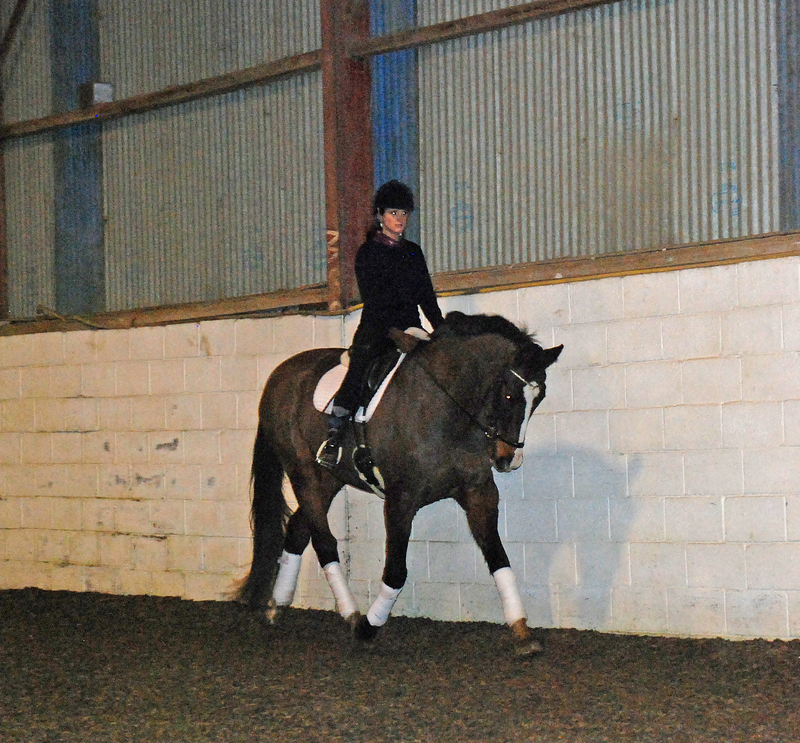 We progressed to working on shoulder in in trot and transitioning between collected and working trot. This felt amazing and I was delighted that I was able to ride balanced in sitting trot on the horse and really feel the effect my seat and leg had on him.When I asked the horse to transition from collected trot he did so with ease and I could feel that there was so much more trot in the tank should a rider ask for medium or beyond. 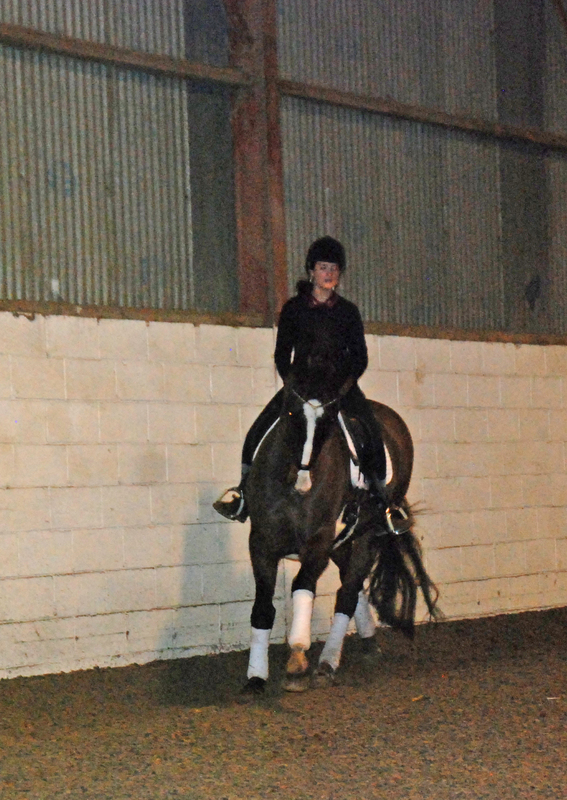 We progressed to canter and where I gelled with the horse in trot, I found canter much harder. 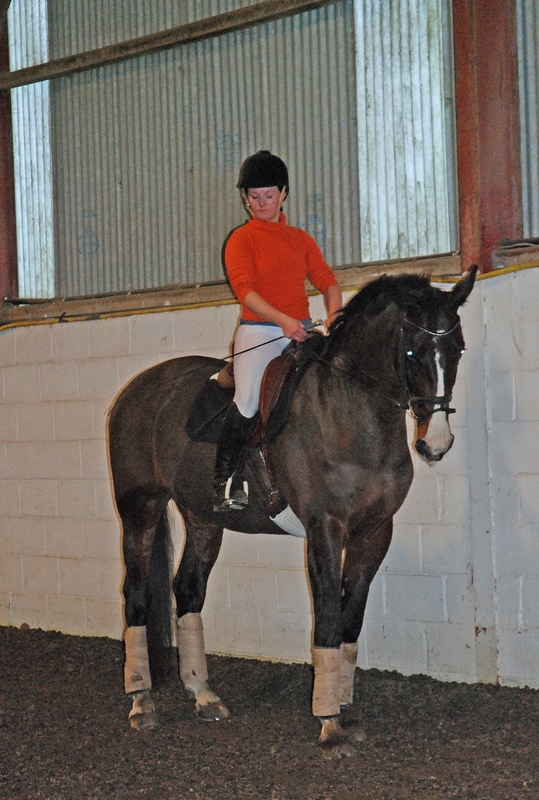 The canter was however the part of my lesson that taught me the most about my riding. At first we switched between too much or too little canter and I realized that this was due to my inability to use my seat effectively in this gait and I know that this is something for me to work on. 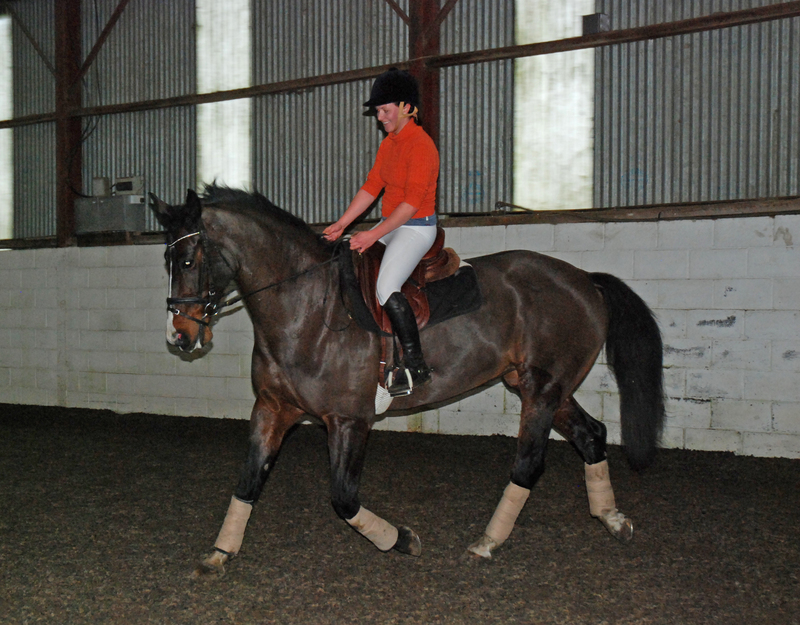 To counteract this we worked on riding upwards and downward transitions between walk and canter and working on circles. I found this easier on the left rein and this would ring true on many horses that I ride – I know that this is partially due to a scoliosis in my back which causes me to gravitate left but also I could see that on the right rein I was using too much inside bend and needed to relax my right hand and use my legs and my outside hand more. I was struck by how genuine and patient St. Emilion is. He tolerated my many mistakes and tried every time to produce anything I asked him for. We finished up my lesson with a movement that I have only ever dreamed of riding – canter leg changes every one or two strides. My task was actually meant to be to ride a flying change. Unlike the exuberant change I get from the horse I ride at home, this was so smooth that it felt like it was effortless. Even better, having changed once, off the horse went showing off his tempi changes across the diagonal. I’ll admit I haven’t a clue what I accidentally did to produce this but it felt incredible! The horses Dani and I rode were quite different. Biala Perla had a really exuberant trot that Dani did a brilliant job of sitting to and the mare seemed to love lateral work. As a spectator her trot looks to spring off the ground. St. Emilion seemed to find the canter changes very easy as evidenced by his ability to do them without much input from me. Sandra explained that all the horses work on a variety of exercises and in different gaits but also will have a natural tendency towards different movements and will find those easier to do than others. This makes sense to me as I can see differences in the two mares I ride – one finds medium work easy, lateral work a challenge and flying changes are near impossible whereas the other can change leg easily but makes me work hard for medium trot. I learned a huge amount on the day and hope to go back in future. Aside from riding such an experienced horse, the individual attention and the tailored advice received on the day was very valuable and will be applicable for me on many horses in various situations. I also gained an increased appreciation and admiration for the co-ordination, strength and mental focus required of riders competing in dressage at the higher levels. Since attending the experience I have been able to ride shoulder in on both of the horses I ride – one of whom has never done it before. Getting the feel of it on a school master gave me the confidence in my aids needed to ride it positively. Anyone interested in the experience should contact 0894678495 or look up ‘Ultimate Dressage Experience’ on Facebook. All content produced on this site is my own original content. Please do not reproduce in any form without my express prior permission. Thank you. Posted on January 29, 2015, in Dressage, General, Irish Equestrian Venues & Pursuits and tagged Biala Perla, Dollanstown Stud, dressage ireland, dressage lesson, dressage lessons ireland, equestrian reality, grand prix dressage horse, learning to ride advanced dressage, learning to ride dressage, learning to ride shoulder in, learning to ride travers, Sandra Blake Farrell, schoolmaster dressage lesson, shoulder in, St. Emilion II, tempi changes, Ultimate dressage experience, walk to canter. Bookmark the permalink. 5 Comments. Well done Lorna, not only to have had the courage to do this, but also to write about it in such an interesting way and to give such an insight into what a highly trained dressage horse feels like to ride. You sound as if you had a really great lesson. I envy you. Very interesting the comment ‘Thinking about translating it into aids’ – it reminds me of Sylvia Loch, as she always tries to get riders to imagine their own body position if they were performing the maneuver themselves on the ground and translate it to saddle? Very interesting article, Thanks. You look great on him by the way!